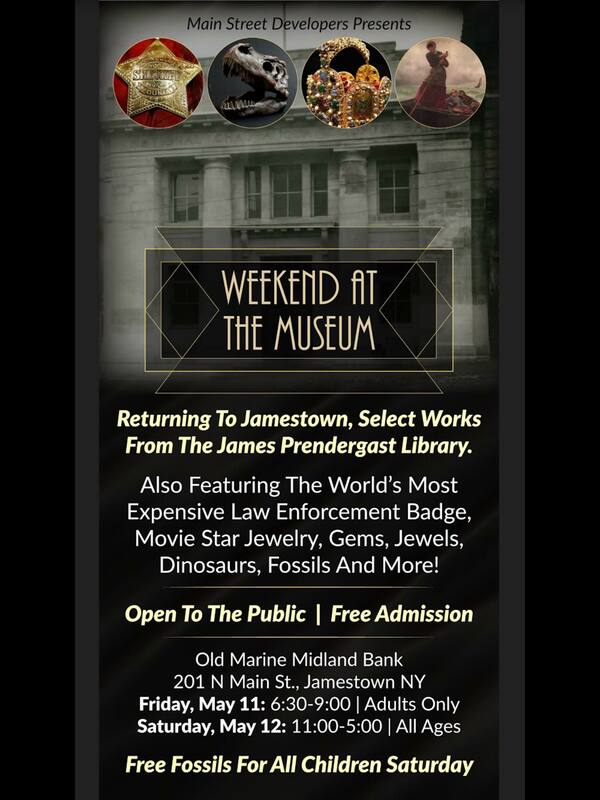 JAMESTOWN – It’s shaping up to be a busy weekend in downtown Jamestown with a variety of activities set to take place starting tonight and continuing into Saturday night. Highlighting the weekend is the final Reg Presents Series for the 2017-18 Season at the Reg Lenna Center for the Arts. 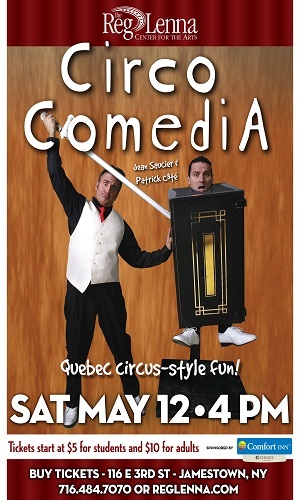 The unique circus-style performance of Quebec-based comedy duo Circo Comedia takes place Saturday at 4 p.m. in the Reg Lenna. Following in the tradition of the Quebec Circus, the duo will perform amazing stunts and hilarious antics for the audience. Tickets start at $5 for children aged 18 and under and $10 for adults and may be purchased at the Reg box office, over the phone at 716.484.7070 or online at RegLenna.com. In addition to the show, Len Barry from the Reg Lenna will also announce the 2018-19 season lineup. The owner and developer of two historic downtown buildings will be displaying several pieces of artwork that had previously been owned by the Prendergast Library. Developer Arnold Duke recently purchased the Old Marine Midland Bank (most recently known as The Forum)at the northwest corner of Main and Second Streets. To celebrate the purchase and raise awareness about future plans for the building, Duke will be showcasing items he purchased at auction from the Prendergast Art Collection both tonight and tomorrow at the former bank location. The “Weekend at the Museum” theme will also feature various memorabilia, including items that belonged to first lady Jacqueline Kennedy, Elton John, Elizabeth Taylor, and Pat Garrett – the lawman who shot and killed Billy the Kid. On Saturday, free fossils will also be given out to children. The “Weekend at the Museum” is taking place at 201 N. Main St. (northwest corner of Main and Second Streets) from 6:30 to 9 p.m. Friday for adults only and then from 11 a.m. to 5 p.m. Saturday for people of all ages. In addition to the Marine Midland Bank purchase, Duke also purchased the former Key Bank building directly across the street in 2017. 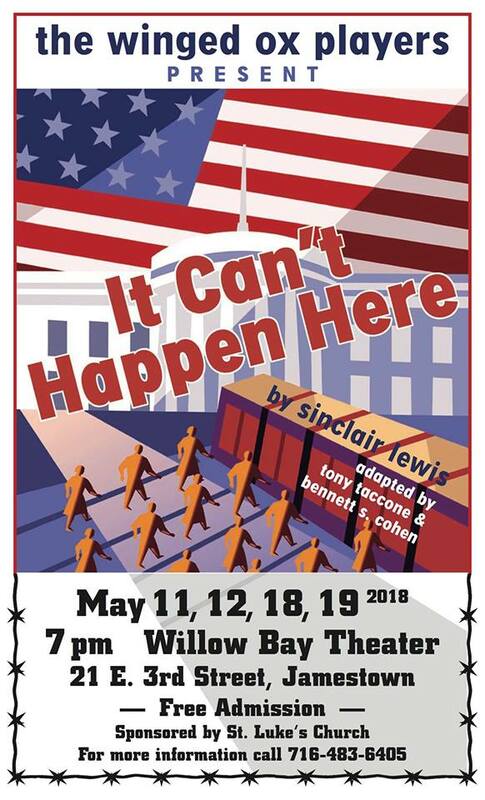 The Winged Ox Players will present the thought-provoking play “It Can’t Happen Here” starting Friday as well as two shows on Saturday at the Willow Bay Theater. Friday and Saturday evening performances will begin at 7 p.m. and there will also be a matinee performance Saturday at 1 p.m., followed by a panel discussion with several community members, high school and college teachers and members of the cast. Admission to the show is free, but free will donations are encouraged. The show will also be shown next Friday and Saturday, May 18 an 19 at 7 p.m.
Also on Saturday The 4th Annual Spring Grapes & Hops Festival will take place at the Northwest Arena from 3 to 7 p.m. The event will feature beer samplings and wine tasting from local breweries and wineries, as well as business vendors from around the area. Visit NorthwestArena.com for more information. Also on Saturday morning, Prendergast Library continues its fundraising efforts with the 12th annual Run for Literacy. The 5K race starts at the library with registration running from 8 a.m. to 8:45 a.m. The race starts at 9 a.m. with walkers starting shortly after. Free T-shirts are guaranteed for the first 100 registrants. Registration costs $20, and can be completed online, at the library, or on the day of the race. To learn more or to register online, visit PrendergastLibrary.org. A Meet the Artist Reception for the new exhibit “Free: New works by Angela Caley” will be taking place Saturday night at the Dykeman Young Gallery on 2nd St. in Jamestown. The event is free and open to the public. In addition to the events listed above, there’s also a variety of live music events to choose from both Saturday and Sunday in the Jamestown area. For a complete listing, visit our Rock and Roll Rundown for this weekend.